Inspired from designs of the 1960's, this Marbled Lokta Origami Paper features a cool, turquoise blue tie-dye pattern against a handmade natural Lokta paper. Both the paper and the marbling are crafted by hand by paper artisans in Nepal. Inspired from the bright colors and patterns of the 1960's, this Marbled Lokta Origami Paper takes design to a whole new level with contemporary colors and patterns applied to eco-friendly paper. 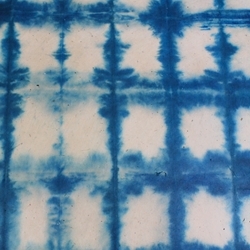 Groovy tie-dye patterns in teal blue against a natural-colored sheet create a mesmerizing piece of art.